Background: The objective of the study was to investigate the effects of glucocorticoid (GC) on the fracture healing process in a closed femur fracture mice model. Materials and methods: Forty 12-week-old female CD-1 mice were randomly allocated into four groups: healthy control and mice with prednisone exposure (oral gavage), 6 mg/kg/day (GC-L), 9 mg/kg/day (GC-M) and 12 mg/kg/day (GC-H). Three weeks after the initiation of prednisone dosing, closed femur fractures were created on prednisone-exposed mice and the healthy control. Prednisone administration was continued for 9 weeks post-fracture, and X-ray imaging was performed weekly to monitor the fracture healing process until the mice were euthanized. Necropsy was performed after 9 weeks and the fractured femurs were isolated and processed at necropsy for micro-CT and biomechanical property analysis. Another 20 mice (control and GC-H, 10 mice/group) were used for histology and micro-CT analysis at early time point (2-week post fracture) with continued prednisone exposure. Results: The results showed that oral administration of prednisone for 3 months in this strain of mice could inhibit endochondral ossification and delay the healing process, especially hard callus formation (woven bone) and bone remodeling during healing. It also could significantly decrease bone biomechanical properties. 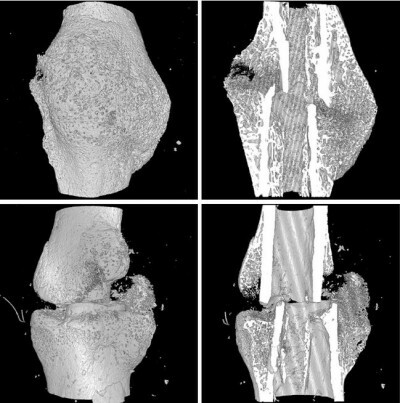 Conclusion: Long-term GC administration leads to significantly delayed fracture healing and impaired bone biomechanical properties. This mouse model may be used to systematically study the cellular and molecular mechanisms underlying fracture healing with GC treatment background and may also be used to study the influence of different therapeutic interventions for bone fracture healing.